On the fifth anniversary of the #BlackLivesMatter movement, the Pew Research Center is releasing an in-depth analysis of the hashtag’s life cycle, as well as some proprietary research showing the role social media is playing in engaging Americans around, well, social issues. The hashtag has been used nearly 30 million times on Twitter since the July 13, 2013 acquittal of George Zimmerman in the shooting death of unarmed black teenager Trayvon Martin. 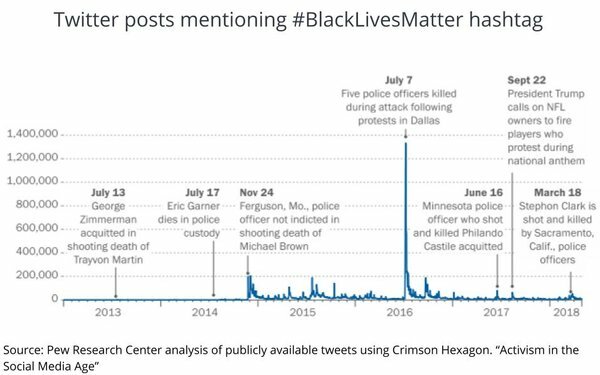 As you can see from the accompanying graphic, it has remained constant, but spiked during other incidents involving killings of unarmed black men. “Around half of Americans have engaged in some form of political or social-minded activity on social media in the past year,” the report finds, noting: “In the past year, 34% of Americans have taken part in a group on social media that shares an interest in an issue or cause, while a similar share (32%) says they have encouraged others to take action on an issue that is important to them. 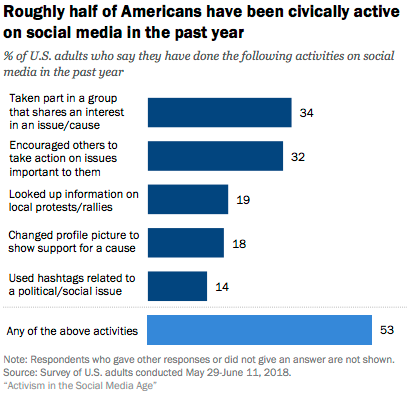 The report also finds that Democrats are more likely than Republicans to report participating in many of these activities recently on social media.